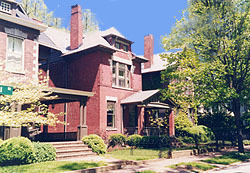 The Gratz Park Historic District is one of the most beautiful areas in downtown Lexington, comprised of a city park and several large residences. In the words of Kentucky architectural historian Clay Lancaster, "the park has charm, atmosphere, a sense of tranquility and of history, and it provides an oasis of planting tucked into the cityscape." Gratz Park occupies a tract of land that was established in 1781 outside of the original boundaries of Lexington when the town plat was prepared that year by order of the Virginia Assembly. In 1793 the park was purchased by the Transylvania Seminary as the site for its Lexington campus. In 1816 a large three-story structure (see historic image below) was built in the center of the park to serve as the main building for Transylvania Seminary. 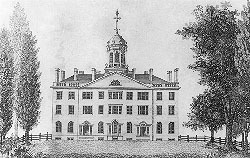 Designed by Matthew Kennedy, Lexington's first architect, it was erected near the center of campus. Following the destruction of that building by fire in 1829, the Transylvania campus was moved across Third Street to its present location. Only one building from this original campus remains--the Old Kitchen Building. Now, grand 19th-century townhouses built for Lexington's prominent and wealthy characterize the district. Once located in the center of Gratz Park, Transylvania University's main building, erected in 1816, was destroyed by fire in 1829. Gratz Park is named after early Lexington businessman Benjamin Gratz whose home stands on the corner of Mill and New streets at the edge of Gratz Park. The historic district consists of 16 buildings including the Hunt-Morgan House, the Bodley-Bullock House, the Carnegie Library, and several other private residences. Typical of residences in the district are the three consecutive row houses along Mill Street (239-247) erected by Mrs. William Cassius Goodloe, widow of a former U.S. Ambassador to Belgium, around 1901. At the northern edge of the park is the "Fountain of Youth," built in memory of Lexington author James Lane Allen using proceeds willed to the city by Allen. The park was deeded to the city of Lexington during the mid-20th century and is still used as a public park today. It is a wonderful place for a picnic or to examine the beauty of this historic district. The Gratz Park Historic District is bounded by West Third and West Second sts. on the north and south, and by the buildings that line Mill and Market sts. on the west and east. The park is open to the public. Several houses within the district that are open to the public are also included individually in this itinerary. The park is admistered by the Lexington Parks and Recreation visit their website for more information.